Make sure to check our Purebasic forum section, there's a lot info/source code for you to learn. One day I would like to do a demo using 2D animation like those used on a PS3 game called "Puppeteer" (of course not on the scale of awesomeness of this game ), I think they used this method you've said, it looks really nice and I loved that game. I'll for sure code more things using js/canvas/webgl in the near future and hope to get more people here interested on this, because now on browsers you can do any kind of hightech demo you can imagine, there's also the new webgl2 that use opengl glsl es3, but you still can do alot with webgl1 too, and of course people can do all sorts of oldschool intros with it . Really welldone @aNdy, liked it alot! Really glad to see such a cool entry, welldone again! @Kirl: 2.5D matte painting looks really interesting, never heard of it before. I found JS really easy to get, it helps that I've been coding on other languages for some time of course. WebGL is Opengl ES 2.0 and I've done some of it on my experiments on Android, it was also really nice to code. @boogop: I've checked webgl before (some years ago), but didn't have enough experience on opengl to fully understand it, also never liked html, always thought it was slow and incompatibly. Now seems to be a standard that those browsers companies agree to follow (IMHO). Here is my entry for the challenge! I'm really impressed on how much you can do now on browsers these days, very fast and smoothly effects using webgl or even on html5 canvas 2D, pretty cool stuff. Click on the button "Start WebGL Demo" or on canvas to start playing. Nice to see you are using FASM, like it a lot! 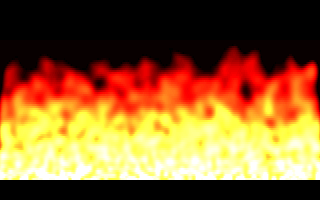 I like that fire, but how about use some more bytes to add more colors and make it more shaded? Unfortunately I don't have purebasic nor linux installed, but here some ideas for you to research about it. Using Energy's example, you will need to remove "wimm.lib" and "kernel32.lib" they are windows specific, on linux you will use SDL.